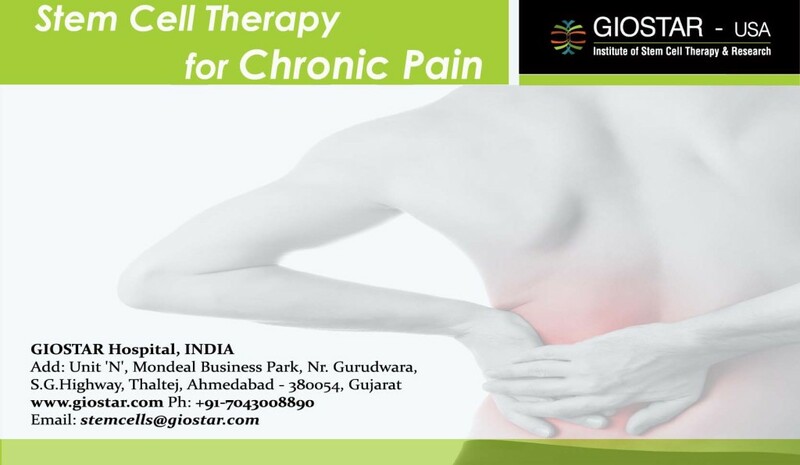 Chronic pain syndrome is a common problem, affecting almost 40-50% of total world population. Pain is the sensation that is been triggered by the central nervous system as an alarm of a possible injury. However, in case of chronic pain, these signals are kept on firing by the nervous system, which can be continued for weeks, months and years. This type of pain can as well be called as neuropathic pain due to the pathological changes in neurons of the peripheral and central nervous system. There need not be any past injury or evidences of any, body damage for the initialization of a chronic pain syndrome. The chronic pain can be defined as the pain that has lasted for more than 12 weeks and not responding to any treatments. Thus the chronic pain is considered to be more challenging than other disabilities as there are no objective evidences or findings, supporting the chronic pain and there are as such no medical tests available so far, which can measure its levels. The chronic pain can be accounted for the most universal form of the human stress. The chronic pain syndrome being very common; its prevention, assessment and treatment are the principal challenges for healthcare providers. The prevalence rates of chronic pain syndrome may vary, but it is so far clear that almost more than 50% people only in the US are suffering from one or the other types of persistent pain. In a more detailed study, more than 45% of the people are suffering from musculoskeletal pain such as back pain, neck pain, knee pain, etc. Most recent data has confirmed that more than 13% of the people worldwide are suffering from the pain daily. Chronic pain is the pain that last for more than normal healing period i.e. 1-2 weeks. In general, it is very difficult to evaluate the severity of pain because majority of the pain is classified as imaginary and only the patient can experience it. Furthermore, it has been observed to be disturbing sleep and hence degrades ones health and functional capacity. This can in turn be responsible for financial burden on the individual. Some of the factors, which can be responsible for pain, are injury, disease, viral or bacterial infection, accidents, surgery, etc. Mild to severe disturbing sensation such as shooting, burning, aching. Feeling of discomfort, soreness, tightness or stiffness. Withdrawal from activity and increased desire to sleep. What goes wrong in the Chronic Pain Syndrome? Chronic pain is a challenging condition wherein the pain remains active in the nervous system beyond the period of healing. The chronic pain need not be always an after effect of any injury or infection. This can take a toll on person’s physical, emotional and financial well being. For instance, the most commonly, a chronic pain may originate from headaches, joint pain, back ache, etc. Other kinds of chronic pain may be originated from sports injury or generalized muscle or nerve pain can also be accounted into chronic conditions. It is evidently observed that the above mentioned pathological changes can damage or weaken the neuron in the central nervous system. Due to this damage, the normal pain signalling process can be disturbed to the great level. This in turn can cause hyper sensitization or spontaneous neuronal activity of the nervous system and hence nerve within that system cannot work to transmit sensation to the brain. This leads to the sense of numbness due to which an individual may experience pain in the affected region. These unique properties of stem cells may be exploited to differentiate them into neuronal origin to compromise with the nerve damage in a chronic neuropathic pain. Intravenous Administration:- Through this mode, cells are infused through the veins expand blood volumes in the central nervous system, to ensure that the maximum number of cells are reaching to the targeted area. Once infused back in the body, these cells may be repopulated at the damaged parts of the organ, through their strong paracrine effects and differentiate into lost or damaged cells to restore back the function. These stem cells are known to create a suitable microenvironment to accelerate the secretion of growth factors, promote the differentiation of targeted cells e.g. in case of chronic pain syndrome, brain cells of central nervous system are generally targeted. This will help to restore back the lost function. Thus with our standardized, broad-based and holistic approach, it is now possible to obtain noticeable improvements in the patients with the chronic pain syndrome, in the symptoms as well as their functional abilities.